Any Effort At Bringing Aviation History Alive Is Meaningless Unless We Share What We Know With Those Who Follow In Our Footsteps. National Airlines—Gone but not Forgotten. Today is the day I want to go back and talk about a man who helped make general aviation what it is today; however, first I want to ask you a few questions…. Who was the first to fly? There has been a lot of controversy over this topic but for me it was the Wright Brothers. The important distinction that has to made here is that the Wright Brothers were the first to fly a self-propelled, heavier-than-air, aircraft that was controlled and not rely on the wind and luck. Now, there was a bit of luck involved with the Wright Brothers flight because they had not mastered the correct size for the canard as well as the wing warping technique of control was not yet perfected but my question is……who was sitting in the seat of this historic flight? Was it Wilbur or Orville? Well, as luck would have it, there was a coin toss that decided the issue, Orville had that privilege. Who was the first in space? John Glenn right? Well, not exactly….On 12 April 1961, Russian cosmonaut Yuri Gagarin became the first human to travel into space when he launched into orbit on the Vostok 3KA-3 spacecraft; however, you probably knew that if you read my blog routinely. There is an interesting footnote, however, that you should know…Vostok 1 had no engines to slow its re-entry or a way to land safely so about four miles up Gagarin ejected and parachuted to Earth. In order for the mission to be counted as an official spaceflight the Fédération Aéronautique Internationale (FAI), the governing body for aerospace records, had determined that the pilot must land with the spacecraft. Soviet leaders indicated that Gagarin had touched down with the Vostok 1 and did not reveal that he had ejected until 1971…..Interesting. So, it looks like the Americans were the first in Space after all. For the complete story CLICK HERE. I would ask you now who was the first American in space but I know you know that answer – Alan Sheppard right and John Glenn was the first American to orbit the earth. Amazing that these events occurred less than sixty years after the first flight by the Wright Brothers. OK, let’s talk about the first airplane salesman….do you know who that was and no it wasn’t Wilbur Wright? Jack Adams was an interesting man to say the least and while I have tried to research his history there is very little out there. Here is what I know…..
Jack began his career in aviation as a crop duster but he also flew for the United States Army as a Flight Instructor, a pilot for C and S Airline, and a Captain for Delta Airlines for twenty years. Jack retired from Delta Airlines in 1963 to devote his full attention to buying, selling, and trading used aircraft. He was the first private airplane salesman in the United States, and at one time, he possessed the largest used aircraft sales. Jack Adams, and his partner Jack Wall, had an interesting way of doing this. They would buy the airplane sight unseen. Of course they would offer bottom dollar but they made top dollar, most of the time, when they sold it. 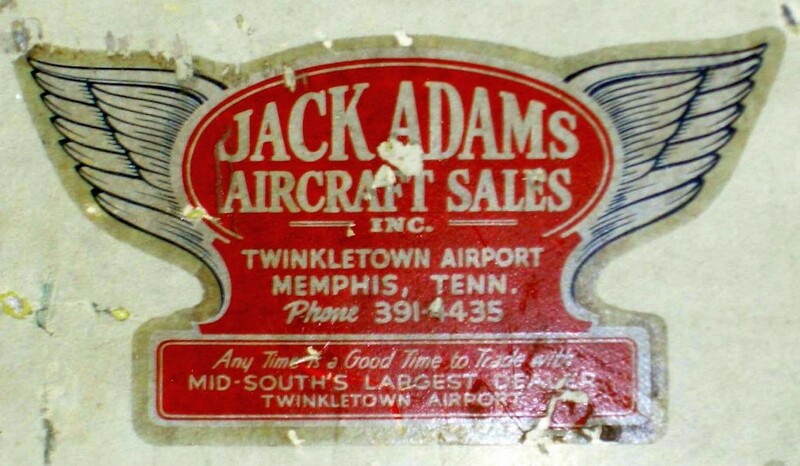 When Jack Adams was still flying for Delta he would always check in with the local airport operator, as he flew over head, and ask if there were any airplanes for sale. If the answer was yes, he would make an offer and then give his name and number. If the owner agreed he would pick up the airplane and bring it to his operation in Twinkletown. Now where in the world is Twinkletown? Twinkletown is located in Mississippi just south of Memphis. If you fly in to Memphis there is an intersection on the Marvell arrival labeled TWIKL. I am not sure if this is still valid since I live in Bogota, Colombia, and haven’t flown in the US in 10 years, but this intersection marks the spot where Twinkletown airport is located. As I have previously said, there is very little information out there on Mr. Adams. My friend Kevin H., who grew up working at Twinkletown which his Grandfather operated, has fond memories of this place. He is familiar with some of the history, and the players, but so far we have not been able to find any written information on the history of Jack Adams. Kevin has put me in contact with a person in Memphis who has an intimate knowledge of the facts but I have not yet made the trip to Memphis. If you are reading this Kevin, I am still working on putting a book together on the life and times of Twinkletown but it is difficult………………Patience old friend this is a story worth telling. There is a 163-acre cattle ranch located at the corner of Goodman and Horn Lake roads near Walls, Mississippi, ten miles south of Graceland. Elvis discovered the ranch while driving down Horn Lake Road. A fifty foot high white cross on the property caught his eye and prompted him to buy the ranch from airplane salesman Jack Adams for $300,000. The ranch was previously named Twinkletown Farm before Elvis renamed it the Circle G, with the “G” standing for Graceland. The ranch generated no income and began to drain Elvis’s personal savings. At one time, Elvis purchased 25 Ford Ranchero trucks and distributed them to friends and whoever was present at the time. The ranch was a safe haven for Elvis and Priscilla who frequented the place often and stayed in the three bedroom trailer on the grounds, although there was a single bedroom ranch house as well. Elvis added eight other trailers for friends and staff. He also purchased eighteen head of Santa Gertrudis cattle and stocked the ranch lake with fish. Elvis later named the ranch the Flying Circle G Ranch because there was already a Circle G Ranch in Texas. At the advice of Vernon and others, Elvis finally realized the enormous costs involved in upkeep, and sold the ranch on May 21 to Lou McClellan for $440,100. I never knew Jack Adams but I did know his partner, Jack Wall, and in fact bought an airplane from him in the 1980s. By this time Jack Wall had broken off from Jack Adams and had his operation at the Memphis International Airport. Jack Wall was a prince of a man and continued the technique of buying sight unseen for many years after he split off from the Twinkletown operation. Have a good weekend, take some time away from aviation/work, and enjoy life. Our time here on earth is limited and tomorrow when we wake up our time here is one day shorter. Copyright 2016 Gatekeeper Publishing, Inc. All Rights Reserved.